Many years of experience in electrical contracting give us the benefit of knowing industry challenges and finding solutions to meet your needs. Pavletich Electric & Communications, Inc. prides ourselves on our ability to get the job done right and on-time. Our team understands not only how to anticipate and define problems... but how to solve them. Working with Pavletich Electric & Communications, means that you, as a client, are serviced throughout evaluation, design, construction, and maintenance phases of each project by individuals who have chosen to specialize in a specific area of expertise within the electrical and communications industries. Thus providing Pavletich Electric & Communications (and our clients) with a highly motivated team of employees dedicated to the delivery of services at the highest level of quality possible while installing the best products made in the world today. 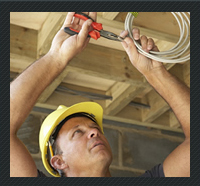 We perform residential wiring for all types of residential homes. This includes lighting, power, cable TV, computer data, spa wiring, ceiling fans and more.